Heathered cotton slub t-shirts feature contrasting sleeves and ribbed neckline binding. EAT SLEEP FISH features applied chambray words & fish icons with wood button eyes. 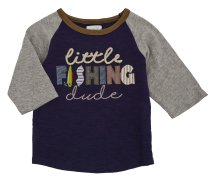 LITTLE FISHING DUDE shirt has a twisted rope and embroidery. 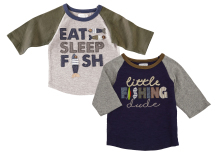 A super cute combo for the little anglers in your life.